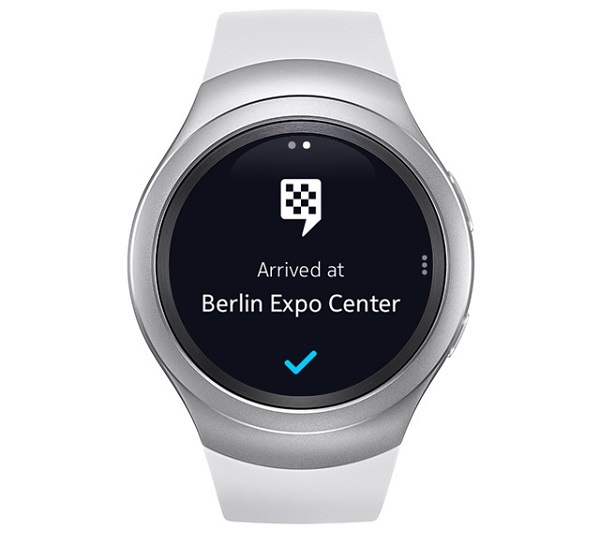 HERE for Gear app launched for Tizen-based SAMSUNG Gear S2 smartwatches. HERE for Gear is a turn-by-turn navigation app designed just for the Samsung Gear S2. You can find HERE for Gear by searching for 'Navigator'. HERE for Gear works in companion mode with HERE for Android on your smartphone. You can install HERE for Gear on your brand new Samsung Gear S2 to get drive and walk navigation. HERE for Gear will be available when the Samsung Gear S2 arrives in stores worldwide this fall. Building on its partnership with Samsung that was announced last year, HERE also powering all location experiences on Tizen devices like the Samsung Gear S2 with its HERE mobile SDK. The preinstalled Samsung Maps on all Samsung Gear S2 devices integrates with the HERE for Gear app when you need turn-by-turn navigation. Use the Samsung Maps app to see your current position on a HERE map and search for places like hotels, restaurants or theaters nearby. When you've found a place you can select the information button to get more details about the location. Tapping the directional arrows icon will show you how long it will take to get there from your current position. Selecting "Navigate" from this screen will open HERE for Gear for turn-by-turn walk or drive navigation. Since HERE for Gear is designed to work in companion mode, the HERE app on your smartphone will automatically detect that you've started guidance and start up so you can see your maneuvers on the map. Similarly, searching for a place and starting navigation in the HERE app on your phone will automatically open HERE for Gear on your Samsung Gear S2. You can then either mount your phone in an in-car holder for visible guidance or leave it in your bag - your Samsung Gear S2 will let you know when you need to make a turn. When you need to make a turn, the Samsung Gear S2 face is updated with the new maneuver and will also vibrate to indicate the turn as well as vibrate when you have reached your destination or if you are being re-routed. When you've arrived at your destination select "ok" to confirm and the app exits guidance both on the watch and on your phone. The notification feature is also really handy when you need walking guidance. You can leave your phone in your pocket and get subtle alerts on your wrist while exploring an unfamiliar city. This leaves you free to see what's actually around you, rather than focusing on your phone screen. HERE for Gear also works with S Voice on the Samsung Gear S2. Simply choose S Voice from the start screen and speak your destination, for example "Navigate to Heathrow airport," and HERE for Gear will start up and calculate the route. HERE for Gear works in companion mode with the HERE app on your smartphone. This puts just the right amount of information you need on your wrist in a lightweight, sleek design and leaves the phone to do the heavy processing, helping save battery life. There's also no need to send routes back and forth between devices since the Navigator app on your Samsung Gear S2 will automatically start up when you start navigation from the HERE app on your smartphone and vice versa; start navigation on the Samsung Gear S2 and navigation starts on the phone. Companion mode also means that when you search for places in the HERE app on your smartphone, you’ll see those same places show up in the recent list when you start Navigator on the Samsung Gear S2 making it easy to find the place you need to navigate to.